In total, 335 large size replications of Ajanta cave paintings had been made by Dr. Griffiths. But again, adversity had never left behind. When he sent all the replications to the south Kensington museum of London, another conflagration came as an imprecation of devil and destroyed most of the wonderful pieces of Mr. Griffiths. Only remained 150 copies; those are probably now stored in the Victoria and Albert Museum of London. 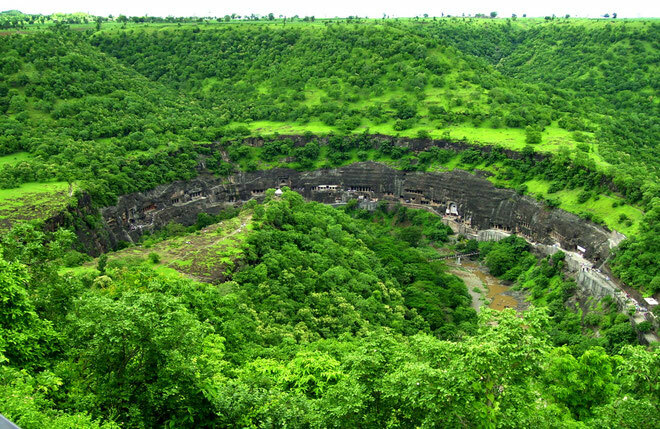 Meanwhile, the assault of the common curious visitors had been running in those caves of Ajanta. The officials of NIZAM (the title of the hereditary ruler) were trying to sell those paintings and to do so; they tried to pick up the paintings from the surface of the cave’s wall! They even got a contributor in this effort who helped them physically. The name of this great contributor was Dr. Bird, a professional archaeologist who lived in Mumbai. It would not be a hyperbole if I say, they merely gained some colourful dust from the wall of cave. The wife of Lord Buddha and his son watching the Lord begging on the street. 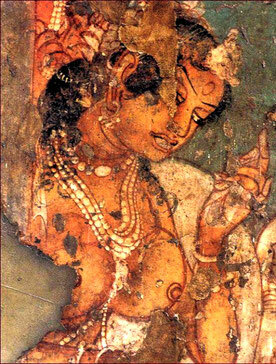 In 1909, in the exertion of Lady Haring Hum, an initiative had been taken to reproduce the paintings of Ajanta. A group of Indian master artists involved themselves in this legendary work. Those were respectively, Nandalal Basu, Syed Ahammad, Asit Kumar Halder, Dorothy Larcher, Samarendra Nath Gupta and more. She gifted all the replications to the “India Society” of London. The above damaged painting of Ajanta cave(left side)is an example that reproduced by the Lady Haring Hum(right side). An unforgettable initiative finally staged by two Italian specialists to recover all the demolished frescoes of Ajanta cave. We Indians are cordially thankful forever to Prof. Lorenzo Cecchini and Count Orsini for such efforts. They removed all the defective colors unnecessarily used by some incompetent artists Moreover, they recovered paintings by maintaining the identical colors and to keep it durable, they even used a kind of transparent gum on the paintings and therefore, it moved to its original luster. 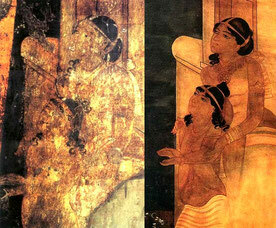 They functioned in Ajanta from 1920 to 1922. In the modern era, most of the paintings we found in Ajanta cave that recovered by those greatest Italian specialists although, in 1935, some new paintings in the deepest parts of Ajanta cave discovered by some tourists and those are still, in good condition. The specialists and historians referred the paintings of cave No.9 and 10 as the oldest paintings of Ajanta and established the time period of first century AD. Assuming the craftsmanship of Ajanta caves, historians and specialists have divided all the caves into three eras. Based on the style and values of the paintings of the said number of caves, it had been distinguished as the oldest process of painting. The color of the paintings is too somber and the drawings of those paintings are not so graceful, however, in those paintings, we got some wonderful decorative works bearing the highest label of artistry as well as the finishing prompting us the great artistic sense of representation. Indeed in Ajanta cave, not a single work is incompetent or inferior quality rather we easily understand that the fundamental concept of artistry was established in the strongest tradition of oriental art which they acquired from the world’s oldest grammatical concept. In my past write up, I discussed in details about the said grammatical concept and here I would like to suggest you read that oldest grammar book to dig the cave paintings of Ajanta. The historians have determined the period of time of the number 9 and 10 caves were BC second decades to 236 AD. They also proclaimed that it was probably created by the order of the kings of Satavahana dynasty. Although pieces of evidence said that those kings were Brahmans by the cast, however, they admired the concepts of Buddhism. Probably those caves they built to dedicated to Buddhists for the worship. It is clear that the place was covered with the abstruse forest as well as impassable for common people. Artists who immersed in the formulation in those impenetrable dark caves had no engagement in the outer part but they had the empathy in the flavor, smell, and torment of the human life as well as in the surrounded nature and its elements which intensified and obsessed their soul. It reflected in each of their work and they revealed out the sense of humanity and compassion even in an insignificant part of their paintings. Each of their painting is soundly expressing the upsurge of life. Here the delight of life is endless. It is wondering that they restrained all their emotions in a simple but impeccable theory of composition prevailed by the rhythmic but sharpest line drawing. In every composition, they performed the highest label of the conception of balance, proportion, perspective and a systemic harmonious relation between several objects that profoundly have produced the emotion of human life. Thank you for reading the article. Don't forget to press out your opinion below; I'll be waiting for your precious feedback.